Hello File! It's been a year since we did the playtests so those have been taken care of but I do appreciate the miniature suggestions. I'm familiar with all of those except for Fists of Furry? Though now I have a really awesome mental image of Kung Fury but with furries instead. I'm actually going to release a free script kit soon so that anyone and everyone can make whatever miniatures/maps they want to share/sell. But if you or anyone else are interested, I'd love to get some testing on this notice board thing I scripted at the Hall to help get some games started for everyone. It's a new script I made so I'm not 100% sure it'll work without spontaneously combusting in to virtual flames at some point... And hi Fionalein! I can only speak for myself, but I don't always use the map boards, I only use them when it's a larger battle since it makes it much easier to keep track of who's where doing what. Thank you for mentioning the Faire, myself and a few others are actually running tabletop games at the Fantasy Faire this year like we did last year! And we are looking for more gamemasters to volunteer and run some more awesome games to help raise funds for the charity. For those that don't know, the Fantasy Faire is an incredible yearly event that's part of the Relay For Life of Second Life. It helps support the American Cancer Society through donations and goodwill with a variety of special events, not just shopping. Among other things, there are dances, hunts, live performances, quests, auctions, and yes, pen and paper style tabletop games! Until March 31st, we will be accepting applications for storytellers/dungeon masters for those that want to run a game or two at the Fantasy Faire and help out. For more info on the Fantasy Faire, their website is: https://fantasyfairesl.wordpress.com/ And to sign up as a volunteer gamemaster for the tabletop portion, please visit here for more information. https://fftabletop.weebly.com/gm-hosting.html I will be running a 5E one shot that I'm writing for the first time at this year's Faire. It involves steampunk goblins. And robots. And a temple hidden away on a floating island. And lots and lots of goblin alcohol. That's all I will say on it. This reminds me of a Restaurant to Another World. The idea of having a place for characters from any world to come and interact is very cool. It'd be a good waystation for people to visit when the sims they normally play at are slow and could be a way of finding places to play that don't advertise as well as they could. The only problem I can see would be some places wouldn't like their players bringing back tales of some outside setting location. Maybe include a suggestion somewhere within the setting (say on a menu notecard or texture) that experiences there should be forgotten or considered a dream after leaving? Taking a break from decorating the new tabletop RPG hangout I'm putting together. I always perch on the highest point. Eating a brunch burrito, listening to music, and working on a wolf head drinking vessel in Blender. The warm up/procrastination to making a female elven necromancer miniature. Certainly! And with that, there are now four spots left in our planned group of playtest GMs. If anyone else wants to give it a try, let me know and I'll get with you as soon as possible. For the holiday our playtest GMs are getting our Fallen Cupids miniatures and in addition to that, our first kit of Structure pieces to help add walls, windows, doors, and other things to your games. An example of what's possible with it all is shown below. Only six spots remain! Still looking for qualified dungeon masters, game masters, and storytellers to give our kits a run through in one shots or short campaigns. As a bonus, all twelve are getting a special Valentine's Day inspired Fallen Cupid set of miniatures that comes with a life size static prop version to upset the neighbors with. Welcome to the group and glad to have you. Shadowrun's one of my favorites too! Years ago I was a rigger with Renraku in an RP sim in SL. I miss that sim still. Thank you for the luck! I will take as much as I can get. Awesome! Gamemaster Kit sent to you inworld. If you have any issues with setup let me know, and I would love to hear how an Army of Darkness game goes. If your players want their own dice/phone/cardstock minis, Player Kits are and will always be free. Hello world! I have recently put together a complete pen and paper tabletop game system that can be used to bring your favorite game in to our virtual world to play with your friends no matter where they are in the offline world. I've made efforts to emulate the home game experience as much as possible in ways that just can't be done with a simple web interface. And now I need you. The system comes with a working map board (with hex and square scalable grid), fog of war for the map board, complete set of dice including percentile, d100, and custom face dice (for dice that use symbols instead of numbers), cardstock miniatures that can easily be textured to add any sort of entity to the game you want (with status particles, hover height, stealth transparency, and can even be toppled over), a plug and play group chat phone that helps keep game chat separate from local chat, a working game master screen that can hold whatever pertinent documents you upload, and even glass marble counters for keeping track of things. What it doesn't come with is you, those of you who put forth the incredible effort to spin tales and create new worlds for others to explore. I am looking for twelve game masters who are willing to put our system to the test with a short campaign or one shot. In return for a free gamemaster kit to start your game with, I want feedback on what works and what doesn't, what could possibly be added to make the experience better for everyone, now and in the future. To receive your free kit, please post a response here or send a notecard or message to Remnant Ashbourne detailing to some extent your experience as a game master and what sort of game you would run (whether a one shot or short campaign). While planned out long campaigns are definitely epic in every sense of the word, I understand that for them to be done properly they require a large amount of work beforehand and I want feedback on things to improve sooner rather than later. Even if you don't want to run a game, I'd love to hear what miniatures others would like to see made. I'm concentrating on fantasy ones right now but I will be making cyberpunk and post apocalyptic ones as well. Looking for Pen and Paper Roleplayers. Hello everyone! I've put together a game system to hopefully help bring the awesome fun of pen and paper roleplaying into SL and I'm looking for six groups of playtesters to help ensure all the bugs are smashed effectively. Any aspiring gamemasters, please send a notecard detailing a rough experience history and what sort of campaign you'd like to run (all campaigns welcome). If you're selected, you'll be given a free gamemaster kit that comes with working cardboard miniatures, map board, dice, and other bits and pieces to play with your friends in SL. All you need to bring is your expertise, your books, and well, pen and paper. All that is required in return is that you play with your friends and send us notecards detailing any bugs you run into. 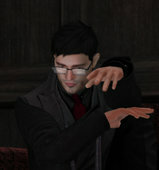 Send your notecards to Remnant Ashbourne inworld, and I'll get back to you as soon as my holiday schedule allows. Wanted: Where would I get this facepaint? Hey everyone. Does anyone know what the facepaint is in this picture? I asked the store owner and unfortunately they didn't. Any help would be greatly appreciated, thanks!